Free sewing patterns are a great way to get inspired to create your own masterpiece! This Ruffle Tote pattern comes to you today courtesy of Robert Kaufman fabrics. It features a pattern to make your own tote and even a little coin purse to match! Spice up your spring wardrobe with this fun and frilly tote bag that's sure to get everyone talking. We've chosen a few fabrics to make your tote and coin purse, but we're sure you'll find lots more cotton fabrics at Beverly Fabrics! Create more wearable fun with wearable how-to's from Beverly Fabrics! Free quilt patterns are a great way to get inspired to make your own quilt! Today's free quilt pattern is called Fresh Cut, from Westminster Fabrics. It's a lap quilt featuring a ruffled edge and paper piecing instructions to put together this bright and happy quilt in a snap. This lap quilt may be small (the quilt top is 48" square), but it's perfect for a brisk spring morning at home or a quiet summer evening drive through the country. We've picked out some of our brightest and most colorful fabrics for this quilt, but we're sure you'll find more lovely cotton fabrics to create this masterpiece. Be sure to check out Beverly's Fabrics how-to projects for more great crafting ideas! Free quilt patterns are a great way to get inspired to create a quilt of your own! 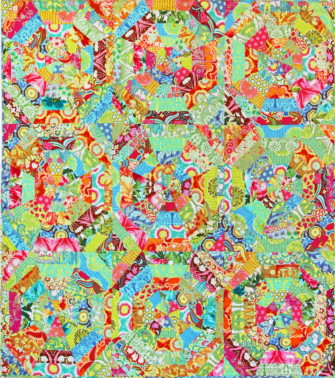 Today's free quilt pattern comes from Westminster Fabrics, the makers of Amy Butler fabrics. This patchwork quilt may look difficult, but it's really just a compilation of squares and rectangles, making it the perfect stash or scrap quilt! Garden Party features bright colors and fun fabric prints, so it's sure to catch everyone's eye, whether you display it on your wall or on your bed! We've chosen a few brilliant fabrics for you to get started with, but feel free to browse around and pick out some cotton fabric of your own. Beverly Fabrics has the best selection when it comes to quilt fabric! Learn and create your own amazing projects with how-to guides from Beverly Fabrics! It's that time of year again! 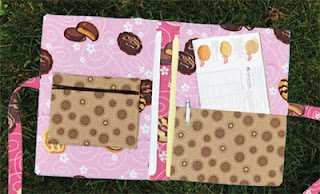 Whether you're a troop leader or a Girl Scout yourself, you're sure to have fun making this handy cookie sales organizer! Beverly's has all the fabrics you'll need for making this fun and unique organizer. Personalize it with fabric paint, glitter, or applique for that special touch! Check out our how-to section for more great projects! Valentine's Day is coming up soon, but it's easy to be ready with Beverly's! We've got a great selection of Valentine's Day how-to's that will help you make the perfect unique gift for that special someone. How about a sweet card with a pocket to hold little treasures and treats, a lovely bookmark, or a decorated plaque to tell them how much you care? We have stickers, ribbon, and all sorts of little embellishments to decorate your cards in our scrapbooking section! Card-making not your forte? Make them a gift they'll always treasure with our Valentine print fabric in sweet colors and styles. Make something unique this Valentine's Day with Beverly's How-To's!